Gum disease is a common and serious infection of the gums that can devastate your oral and overall health. 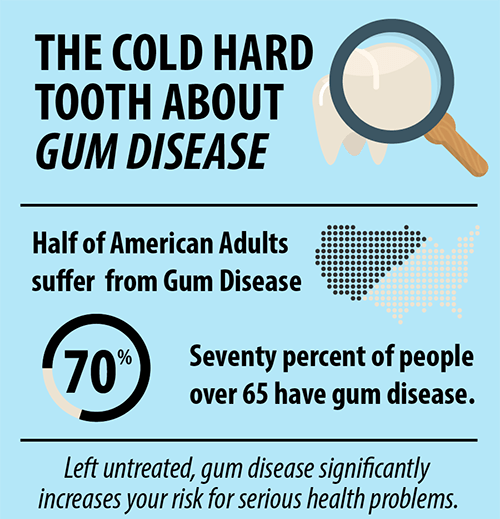 It’s estimated that over half of the American adult population has some form of gum disease, while many cases remain undiagnosed. Gum disease is usually caused by poor oral hygiene, and left untreated can lead to tooth loss and jawbone deterioration, and can also be a risk factor for heart and lung diseases. Deep pockets form between the gums and teeth, which become a breeding ground for the infection to fester. If you’ve noticed any of the above signs and symptoms, or have been diagnosed and are seeking treatment, we would love to help you get your gum disease under control at Spring Creek Dentistry. If you are in the early stages of gum disease, we may be able to reverse it with some simple oral hygiene and nutrition adjustments. However, if your gingivitis has advanced into periodontitis, or advanced gum disease, you may require what we call scaling and root planing. We will go in and remove the infection and sterilize the pockets, and reattach the gums to the teeth. If you have any questions about gum disease, or would like to schedule a consultation with your Spring dentist – Dr. Oakley, Dr. Henley, Dr. Miller, or Dr. Wendt – please contact us at Spring Creek Dentistry today at (281) 407-8333 .